In late 2017 the National Diaper Bank Network launched an exclusive members-only online portal. The member portal is a workhorse of member benefits and access point to tools & resources. As the portal continues to grow more robust we have recognized the need for multiple users for many organizations. NDBN now offers Member Associated Profiles so your team can utilize select member resources at any time. You can assign privileges to staff, board members, and key volunteers to maximize your time. Each member of your team brings unique expertise to the Network and we look forward to getting to know them more! Please see the chart below to determine which members of your team may benefit from having access to the portal. Organization Profile – Access to all online account management options, benefits, & resources. There can only be 1 Organization Profile per account. This profile is assigned during new member onboarding. Why would I need to assign someone with a Member Associated profile? Assigning a Member Associated profile allows you to share the responsibility of managing your member benefits with another person. 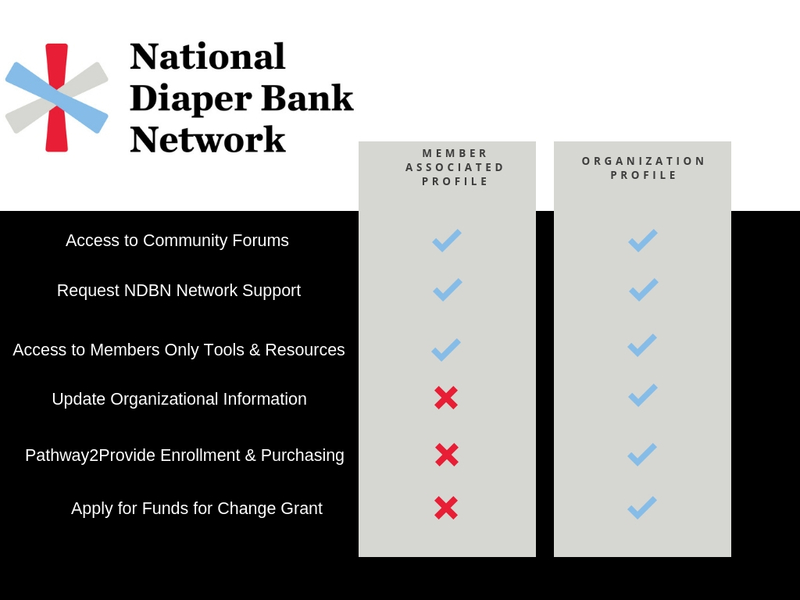 This is helpful if you aren’t always available, or find members of your team would benefit from access to NDBN’s library of diaper bank resources, community forums, and more. How do I request a Member Associated for a member of my team? Please complete this form, and allow up to 5 business days for processing. NDBN will reach out to the new point of contact when the profile has been created & is ready for use. How many Member Associated profiles can I assign? At this time NDBN has not set a number. This is subject to change. NDBN will delete any accounts that are inactive for more than 90 days, so be sure to add individuals who will be utilizing the service. Profiles cannot be restored. How do I remove a Member Associated profile?